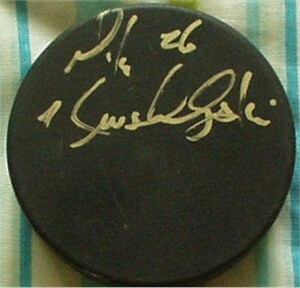 Blank puck autographed in gold paint by former NHL veteran Mike Krushelnysk, who played for the Bruins, Oilers, Kings and Maple Leafs. ONLY ONE AVAILABLE FOR SALE. With certificate of authenticity from AutographsForSale.com.